Home / Fluid Mechanics / FM / What is Venturimeter? How it Works? Venturi meter is a device used to measure the flow rate or discharge of fluid through a pipe. Venturimeter is an application of Bernoulli’s equation. Its basic principle also depends on the Bernoulli equation i.e. velocity increases pressure decreases. The principle of venture meter is firstly developed by G.B. Venturi in 1797 but this principle comes into consideration with the help of C. Herschel in 1887. The principle is that when the cross-sectional area of the flow is reduced then a pressure difference is created between the different areas of flow which helps in measuring the difference in pressure. With the help of this pressure difference, we can easily measure the discharge in the flow. Venturi meter is very simple in construction. It has following parts which are arranged in systematic order for proper operation these are inlet section called as converging cone, cylindrical throat, and gradually diverging cone. Converging section is attached to the inlet of the pipe. The cross-sectional area of the converging section is decreasing from starting to end. One side it is attached with inlet and its other side is attached with the cylindrical throat. The angle of convergence is generally 20-22 degree and its length is 2.7(D-d). Here D is the diameter of the inlet section and d is the diameter of the throat. It is the middle part of the venturimeter and has lowest cross sectional area. The length is equal to the diameter of the throat. Generally, the diameter of the throat is 1/4 to 3/4 of the diameter of the inlet pipe, but mostly it is ½ of the diameter of the pipe. The diameter of the throat cannot reduce to its minimum suitable value because if the cross-sectional area decreases velocity increase and pressure decreases. This decrease in pressure goes below the vapor pressure which results in cavitation. To avoid cavitation a limited value of diameter is preferred. The diverging section is the third part of this device. One side it is attached to the outlet pipe. The diameter of this section is gradually increased. The diverging section has an angle 5 to 15 degree. The diverging angle is less than the converging angle due to this length of the diverging cone is larger than converging cone. The main reason for the small diverging angle to avoid flow separation from the walls and prevents the formation of eddies because flow separation and eddies formation will result in a large amount of loss in energy. To avoid these losses proper angle of converging and diverging should be maintained. A differential manometer is used to measure the pressure in the flow through the pipe and it is mounted between the inlet pipe and throat. We can use different pressure gauges in place of the differential manometer to measure the pressure and different sections. The pressure gauges are mounted at the inlet and throat of the venturi meter. 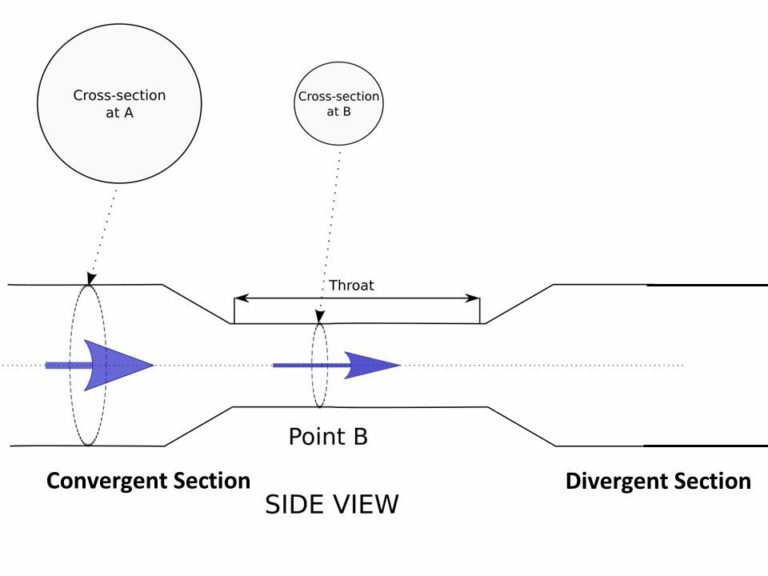 The diverging section is not used for measuring the discharge because at this section flow separation may occur. When fluid flow through the venture meter then pressure difference is created which measured by the differential manometer. Working of venturimeter is so simple. As already explained it works on the principle of Bernoulli’s equation, i.e. when velocity increases pressure decreases. The same principle is applicable here. The cross-section area of the throat is smaller than the cross-section area of the inlet pipe due to this the velocity of flow at throat section is greater than the inlet section, this happens according to continuity equation. The increase in the velocity of flow at the throat will results in the decrease in the pressure in this section, due to this a pressure difference is developed between the inlet and throat of the venturimeter. This pressure difference can be easily measured by using differential manometer between the inlet section and throat or by using two separate gauges at the inlet and throat. By measuring the differential pressure at the two different sections we can easily measure or calculate the flow rate through the pipe. 2. In medical applications, it is used to measure the rate of flow in the arteries. The main advantage of venturimeter is it has very fewer losses and high accuracy. It has a high coefficient of discharge. Venturimeter has high accuracy as compared to other flow measuring devices like an orifice meter, pitot tube, and nozzles. Venturimeter has some disadvantages also like, it has a high initial cost because its calculation is very complicated. The major drawback of the venturimeter is we cannot use it for small diameter size pipe.